Over the years cartoons got known to be something for children or family entertainment. Though some shows have rocked that boat to remind people that animation is for people of all ages including adults. Shows like “The Simpsons”, “Family Guy” and “South Park” have got people a bit more wary of thinking that every cartoon is for kids. Though when you see a soft fluffy teddy bear being animated on the big screen, it’s hard to think it’s not for children. Which leads us to a new movie coming to theaters this week, “Ted”. It’s been a long time since I’ve seen a new musical. I enjoy musicals for the most part. The last one I saw at the theaters that really stood out to me was a film called “Across The Universe” which used only Beatles music. So this one, which focuses on Rock N’ Roll from the 1980’s had my attention, it’s called “Rock of Ages” and takes place in Hollywood in 1987. Growing up I listened more to music from the 1960’s, so I was not sure how much I was going to get into this film, going in I did not even know the plot of the film. Romance is one of those areas in life that doesn't normally entertain me. I usually feel it's forced when shoved into a story, because people like the results of a love story. I do not really hang out with many people who enjoy love stories, so these are not the movies we buy or go see. So when I learned that the movie we were seeing is called "Love, Peace and Misunderstanding", I was debating if I would enjoy the movie or be bored. Many different type of movies come out through the year and I find myself usually more into the action, adventure, superhero, or animated features. To be fair, when I receive a screening pass, I will go to it and just give it a try even if the trailer does not hold my attention. Sometimes I get surprised, like Battleship where I went in not expecting much and came out so thrilled with the fact that I saw the movie. This was one of those pictures where I went in not sure about it, when I told people I got tickets for this movie the biggest reaction is was “what movie?” The movie is “High School”. For me, there’s not many movies out there that when the title is said their theme song gets stuck in my head. Though this is one film where that is exactly what happens. As soon as I hear the worlds “Men in Black”, all I can remember is that theme song that came out back in 1997. It was so good and so cool that I will always remember that song and the original Men in Black movie lands right in that same area, very unforgettable film that stands out. The sequel came out in 2002 and did not get as much love as the original film. Even though life has been a tad bit chaotic lately, I still like to take the time to go watch a movie and relax. I watch previews and read up on certain movies during their production and judge whether or not that movie is perfect for turning off my brain and having a good time while watching. 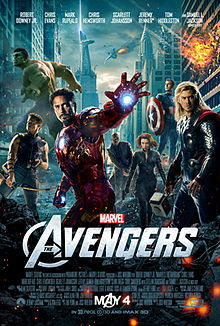 One such movie out right now is The Avengers. It’s already been out for a full week in the United States and it has been dominating any and all competition with good reason!